Israel in photos: Zoharei Chama Synagogue (The Sundial Building). Zoharei Chama Synagogue (The Sundial Building). A large vertical south sundial is mounted on the wall of "Zohorey Khamma" Yeshiva (religious school), in Jaffa Road 92, Jerusalem. 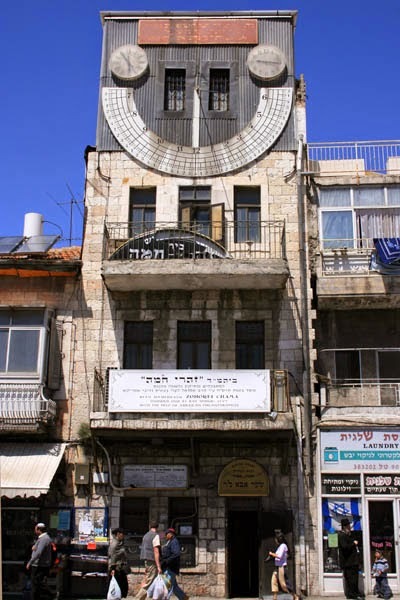 Rabbi Shmuel Levi, a Russian Jew living in the United States and active on behalf of immigrants in Jerusalem, built this unusual building, standing on Jaffa Road near the Mahane Yehuda Market. In 1908, with money collected in the United States, he built the three-story house; the first two floors served as a hostel for 50 people, while the Tiferet Zion Synagogue occupied the top floor. A wooden porch faced east; from here one could see the sunrise in order to determine the time for morning prayers. An unusual feature of the building is a sundial on its facade, built by Moshe Shapira, a self-taught astronomer who had made a study of the science according to the writings of Maimonides and the Vilna Gaon. The semicircular sundial is about 5 meters in diameter, it is very simple designed and very professionally performed, with no ornaments or motto, and it is very accurate, with five minutes, 15 min', and half hour markings. Above it, for cloudy days, were two mechanical clocks. Shapira also built three sundials on the third floor balcony of the building. The time on the clocks was set by Jerusalem time and not, as was customary in those days, by Cairo time. Its construction began in 1908, and Rabbi Moshe Shapira (the same person who built the sundials in the great Synagogue in Petakh Tiqva) finished it in 1917. He built at least 15 sundials in synagogues in few places in Israel, most of them in Jerusalem, and most of them are of the "sun spot" method; all are very accurate). The building was damaged in 1927 in an earthquake and ravaged by fire in 1941. The Sundial Building was partially restored by the municipality in 1980.